North Canterbury comprises four distinct sub-regions. 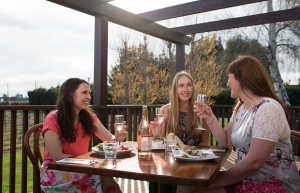 An easy 45-minute drive north of Christchurch will land you at the doorstep of the Waipara Valley (which include Omihi and the Glasnevin Gravels). Fifteen minutes further inland will take you to Waikari. Picturesque Vineyards also lie on the plains close to Christchurch city and further east on the extinct volcanic that is Banks Peninsula. These regions are home to some of the most exciting wine producers in New Zealand. Grapes are grown in the beautiful, natural surrounds of the Waipara Valley. Vineyards are pruned and picked by hand to ensure that every drop is pure quality, New Zealand wine. Our climate is cool with low rainfall and long dry autumns. Following classical Burgundian style and Old World expertise, we are high density planting and low cropping along a low trellis. This maximises flavour as well as protecting vines from the hot dry Nor-West wind. Heading South West there are two other major Wineries and Restaurants making the trip out West worth your while! Melton Estate and Langdales Vineyard are known for their superior wines, function centres and beautiful locations.